If you're from the Midwest or you've spent a great deal of time traveling through this area, odds are, you've encountered a tornado once or twice. These dangerous weather phenomena can pose a serious threat to people regardless of their location, as tornadoes can wreak havoc for those both indoors and outdoors. Much like the variety of other natural disasters that plague certain areas, tornadoes cannot be predicted. Experts can pick up on patterns and dole out safety tips among citizens, but once you're in a tornado's path, there's not much time to develop a survival strategy. Thankfully, there are several tips to keep in mind if you encounter one of these whirling beasts, especially if you're engaged in an outdoor pursuit. As you start making preparations for your next journey, think about the following to stay safe from tornadoes. LiveScience reported that while the overall number of tornadoes in the U.S. has declined in the past 60 years, the amount of tornado clusters - or more than one striking the same area at one time - has risen. In addition, the tornadoes that do eventually form are classified at more severe levels, meaning they bring about a greater deal of destruction than smaller cells. Geography plays a crucial factor for outdoorsmen looking to avoid tornadoes. States like Oklahoma and Kansas frequently see a high number of tornadoes each year, but Northern states, like Massachusetts and Rhode Island, rarely report them. Before you head out, be sure to learn about the state you're traveling to and whether it has a history of tornadoes. 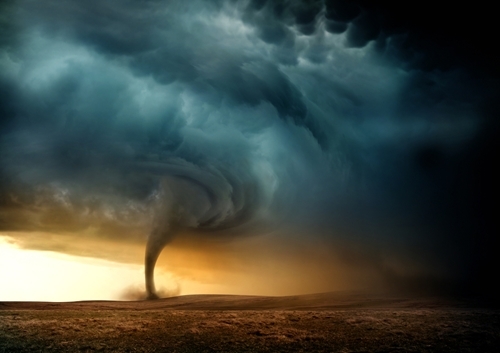 If you are making the adventure out to Tornado Alley - which includes parts of Texas, Oklahoma, Kansas and Nebraska - it's crucial that you prepare for the worst with regards to weather. As you prep for your adventure, there are many supplies you should bring along, as well as tips to keep in mind, that may increase your chance of survival if you're forced to come face to face with one of these forceful cells. While some tornadoes occur during heavy thunderstorms, a large number are not preceded by lightning, thunder or rain. Some tornadoes may form apropos of nothing and occur with few warning signs. The dangers associated with these phenomena are extreme, but conditions may be more lethal for those in the outdoors. Not only do these individuals lack access to sturdy shelters, but they are also less likely to hear warnings from official channels due to lack of service in the wild. Keep your eyes to the sky if you're concerned about tornadoes. Most are preceded by small rotating circles or funnel clouds. However, the Art of Manliness reported that not all tornadoes have these indicators. Another clear sign of a tornado is spinning leaves or debris on the ground, as these pockets may indicate the bottom of a cell formation. If you're adventuring during extreme weather, the clearest sign a tornado may be in the midst is a sudden rush of stillness - think "the calm before the storm." If rain, hail or thunder unexpectedly ceases, a tornado may be close by. As you trek along the trail, be sure to mark certain locations nearby that may serve you well in the event of a tornado. If you've spotted one of these warning signs, use your watch compass to guide you to safety. When picking the best spot, look for a large ditch or empty cave where you can lie down and cover your head. Avoid areas surrounded by small or weak trees as best as you can, though this may be impossible in the woods. Pick shelter near large, sturdy trees with few branches if you have no other option. Tornadoes are very frightening events that can cause some serious disaster. If you are not prepared for them, then things can get ugly pretty quickly. Therefore, the the tips and advice above can serve as an aid to prepare you for these rough situations. In addition, the ProTrek PRW3000-2B has a built-in compass used to navigate you to safety. Grab the PRW3000-2B and don't let a tornado catch you off guard!